Wood is a versatile natural material and wooden necklaces make a fashionable alternative to more traditional metal designs. Perfect for every season, wooden necklaces come in a range of colours, shapes and sizes, and can be worn to complement any look. Click on the links below for more product information or to buy wooden necklaces of your choice. You can add bold glamour to a hint of boho chic with a long wooden bead necklace. Choose earthy or pastel colours to keep the look natural and understated, go for a bright colours to create a more summery look, or black for understated sophistication. 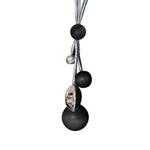 A bold and striking necklace with multi-strand silver-coloured cord, oversized black wooden beads and metal detail. Measuring 80cm long, this necklace looks good when worn over long tops or dresses for sophisticated style. This gorgeous, bright and feminine long wooden bead necklace comes in a vibrant pink (aniline red) colour. Made from sustainable wood, it is light to wear, eco-friendly and long lasting. 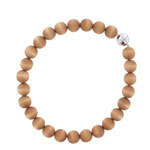 A long wooden bead necklace is for ladies who prefer simple designs and bold effects. Available in blue or black, this wooden necklace is 110cm long, which makes it versatile. Wear it long with long tops or dresses, or double loop to draw attention up to your face. Ideal for drawing attention up towards your face and neck, these chunky wooden necklaces are eye-catching and ideal for adding natural glamour or elegance to your outfit. 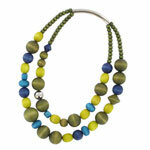 Essentially two-in-one, this gorgeous wooden bead necklace is bright, feminine and chic. Wear it with black for instant impact. The mixed red wooden necklace is ideal for drawing similar shades of red, pink, purple and indigo out of your clothing. A unique and striking wooden necklace with smooth purple wooden beads and sheer black ribbon. The wooden necklace will add glamour to your outfit and suits any neckline. A beautiful and unique dual string wooden necklace with a variety of mixed green wooden beads. Perfect for any season. A shorter version of the Suomi necklace, this wooden necklace in blue, black, brown or red is available online. This wooden bead choker will draw the eye up to your face and neck. 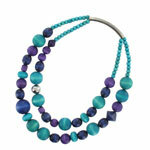 The statement 'Rentukka' wooden bead necklace also features turquoise, purple and blue wooden beads. This eye-catching wooden necklace is bold, bright and feminine - a perfect gift for her to add to to her jewellery collection. This necklace, in classic black, combines wooden pearls and ribbon to chic and striking effect. A versatile necklace that can be worn on its own for subtle glamour, or teamed up with other black wooden jewellery for added impact. 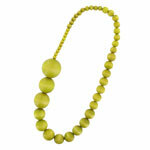 A gorgeous wooden necklace featuring tiny, medium and large wooden pearls in an eye-catching pistachio colour. This striking Scandinavian wooden jewellery design is ideal for ladies who love unique and colourful necklaces. A beautiful and feminine wooden necklace with understated colour and unique design. This wooden necklace is the perfect bridal jewellery and alternative to gold and silver designs for your wedding day. 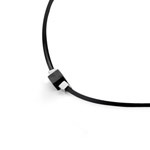 An understated and elegant sandy brown necklace with easy-to-use magnetic fastening. If you love wooden jewellery or natural shades and tones, this beautifully crafted wooden necklace is for you. Look fashionable and funky with statement wooden necklaces. Combine bright wooden beads and shapes with geometric metal detail for a fresh and striking look. 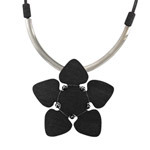 This strikingly sophisticated necklace has a silky wooden pendant in the shape of a flower and silver-coloured settings. Opt for black to go with your little black dress or blue for a fresher look. This striking olive green wooden necklace oozes effortless natural style. With a pendant featuring wooden pearls and shapes, the Fontana necklace is also available in white. 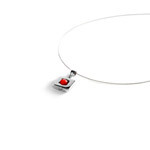 A timeless and elegant design with central red wooden bead in a square nickel-free metal setting. Cheery and light, this wooden necklace is ideal for days at work or evenings out. This wooden design is the ultimate black statement necklace. With flat wooden rings and discs, this striking wooden necklace is bound to attract attention. A romantic necklace design featuring a silver-coloured heart charm pendant with aniline red/pink wooden beads on a black leather imitiation cord. This wooden necklace makes a great gift for Valentine's, an anniversary, birthday or just to show you care. A flower pendant necklace with a modern twist, this wooden design is fresh and feminine. 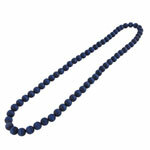 Also available in black, the blue wooden necklace is versatile and can be worn to any occasion. Dress up your jeans and top for casual elegance or team it up with that blue evening dress for feminine glamour. One of Aarikka's latest designs, this is an eye-catching wood and metal pendant necklace. 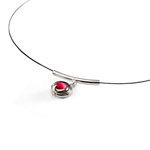 The Jazz necklace has a coloured wooden bead surrounded by three silver metal hoops on a 42cm black wire. It comes in two colours with vibrant red or sophisticated black wooden bead. The wooden necklace is understated style. This design has three cylinder-shaped wooden beads with a metal fastening. Choose from red, purple or black wooden beads. Matching wooden earrings and other jewellery items are available to complete the look. 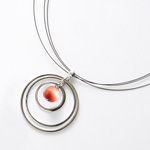 A dainty necklace with red wooden bead that is perfect for work or occasions when you want understated femininity. The dainty red wooden bead pendant will lift your outfit with its subtle hint of colour. With a Tokyo inspired design, this necklace has a black band with three stained wooden cube beads. This wooden necklace is great value for money and understated enough to wear to work, college, university or school. As all our wooden necklaces are extremely lightweight, you'll feel very comfortable wearing them. Wood is a durable natural material and unsurprisingly wooden necklaces often outlast jewellery made from other materials. This means you can feel confident wearing your wooden necklace knowing you've invested in a quality item that will last. Feel green. Aarikka wooden necklaces are created using sustainable wood from Finland. You can look great and feel happy knowing you are not contributing to deforestation by purchasing one of our eco-friendly wooden necklaces. Make sure you're prepared whether its spring/summer or the Christmas party season with one of our beautifully handcrafted wooden necklaces.